zoologists. This awakened an early awareness in the rich variety of bird-life so fortunately to be found in the surrounding environments of the Eastern Transvaal, the West Coast and the Cape Peninsula where she spent her childhood. She studied painting at the Michaelis School of Fine Art under Peggy Delport and sculpture under Bruce Arnot, majoring in History of Art and Psychology. She subsequently completed a computer graphics course at Concept Marketing. allows her to enjoy the life of water birds, as she is a keen canoeist. Particularly drawn towards the penguin colony at the boulders, she decided two years ago to make this a special project, making weekly trips to study and observe the birds - taking time and care to capture the subtle gestures so unique to penguins. She donated one of these studies, done in oil on canvas, to SANCCOB to help raise funds for the seabirds affected by the "Treasure" oil spill. 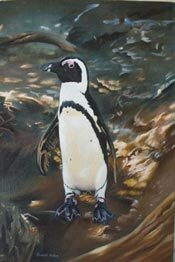 The WWF.SA successfully auctioned this painting on the internet to Bill Hiss of California. Prowse", Elizabeth happily donated a powerful oil painting of a raptor. SA corporates and done several private commissions. She has also completed studies of the Montero Hornbill for a poster for the Percy FitzPatrick Institute of African Ornithology at the University of Cape Town which is to be publically displayed in Namibia. Their aim is to popularise scientific research findings, making them more accessable to the public, thus bridging the gap between art and science. “I am concerned and would like to play a part in conservation, for the reasons that it ultimately affects efforts to realize a better world. Her work has been exhibited at The Cape Gallery since 1997. She has sold paintings to South African Corporates and produced several private commissions. These include an exhibition on the island of Santa Cruz and on various tourist boats in the Archipelago her focus being creatures endemic to the Galapagos Island. The subject matter she is now focusing on are the endemic wildlife of the Cape Peninsula.